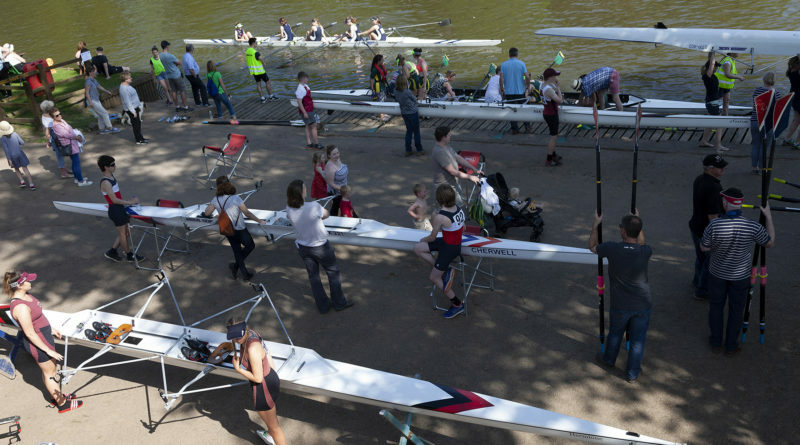 The 2018 Evesham rowing regatta took place on the May bank holiday Saturday (with the Sprint event on the Sunday). The organisers were grateful that it could take place after the River Avon in Evesham had overflowed the banks, and the club landing stage. It only started to subside on the Friday the day before. 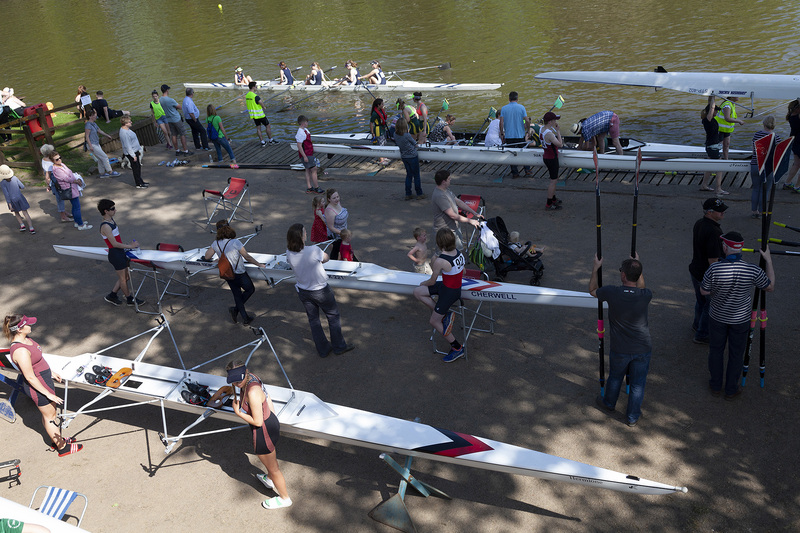 The event is open to all clubs and schools and there were a lot of races for both men and women juniors, with events for under 14s, under 15s, under 16s and under 18s on the schedule (the age requirement is taken from the beginning of the school year. The school teams included Royal Grammar School Worcester, Pangbourne College, King Edward VI School and Cheltenham Ladies College. Junior crews from Stratford-upon-Avon, City of Oxford, Evesham, A.B. Severn, Upton, Stourport and Abingdon rowing clubs also took part in these hotly contested events. There were also club events in the Open section as well as master’s events for men and women. the park and gardens, past the boathouse and finishing just before the Workman bridge. The rowing is around 5 minutes and those crews who managed the steering and the correct rate managed to come out on top. While a lot of races were won reasonably easily several races were won by 2 feet, which over 1000 meters is very close. With lots of supporters lining the banks there was lots of vocal support, including crews who were getting ready to paddle down to the start. Most events had heats, semi-finals and finals so successful crews had three events to win if they wanted to win the cups. Due to obstructions on the course one crew from Stratford-upon-Avon in women’s quad sculls had a race three times before they actually won their race. With the sun blazing down and temperatures rising all crews were advised by the course commentary team to add extra sunscreen, wear a hat and takes bottles of water for re-hydration. At the end of the event the team with the most wins was City of Oxford Rowing Club with seven wins, closely followed by Abingdon Rowing Club, Evesham Rowing Club and Pangbourne College Boat Club who all had six wins. The winning mugs were presented by deputy mayor Mark Goodge and Evesham Club Chairman John Lomas. The course record (from a Head of the River event) is still held by Sir Steve Redgrave and Sir Matthew Pinsent in a pair. Clubs will now be planning their next events during this season before returning in 2019 for the 2019 Evesham Regatta, hopefully in similar weather.